tanding some 100 yards apart and surrounded by 60,000 fans at Chicago’s Soldier Field, Landon Donovan and Tim Howard shared the same, split-second thought: Don’t shoot. Donovan’s corner kick appeared to be bound for striker Taylor Twellman when it was headed high and clear by a Mexican defender. 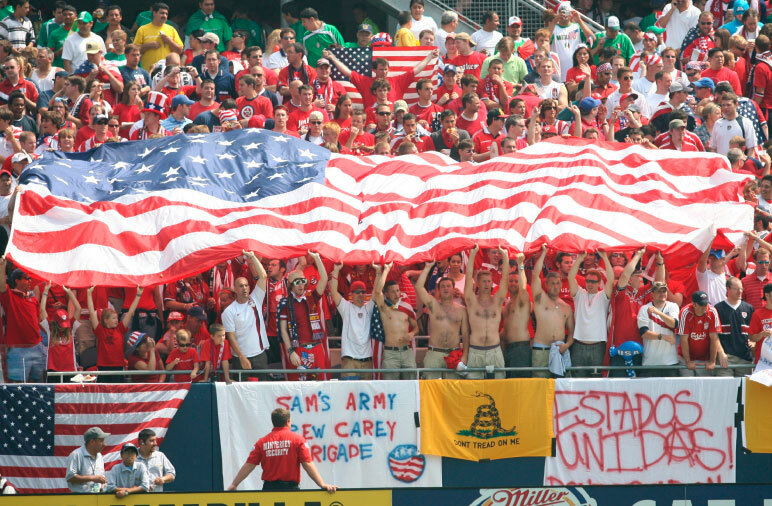 The 2007 CONCACAF Gold Cup final, contested on the afternoon of June 24, was tied, 1-1, in the 73rd minute. Eleven minutes earlier, Donovan had leveled the score from the penalty spot, tying Eric Wynalda’s record for goals by a U.S. player in the process. The Americans had captured the momentum and neither Donovan nor Howard, both accomplished veterans, wished to see promising pressure wasted. The ball fell toward 22-year-old midfielder Benny Feilhaber, who was standing a few yards beyond the edge of the penalty area. He was the third-youngest player on coach Bob Bradley’s Gold Cup squad and was appearing in just his seventh senior international. Feilhaber wasn’t someone who worried too much about the odds. In 2003, he was a walk-on at UCLA. Two years later, he was playing for the U.S. under-20 team at the FIFA World Youth Championship, and in 2006 he made his Bundesliga debut for Hamburger SV. The following spring, Bradley gave Feilhaber his chance. Like the Mexican defender’s header, it came at him quickly. He wasn’t going to waste it. Twellman, who’d entered the match as a substitute a few minutes earlier, barely had time to turn around. With the score tied 1-1 in the 73rd minute, Feilhaber’s teammates were thinking only about maintaining possession, but the 23-year-old newcomer watched Lozano&apos;s header off the corner kick falling to him and never hesitated. 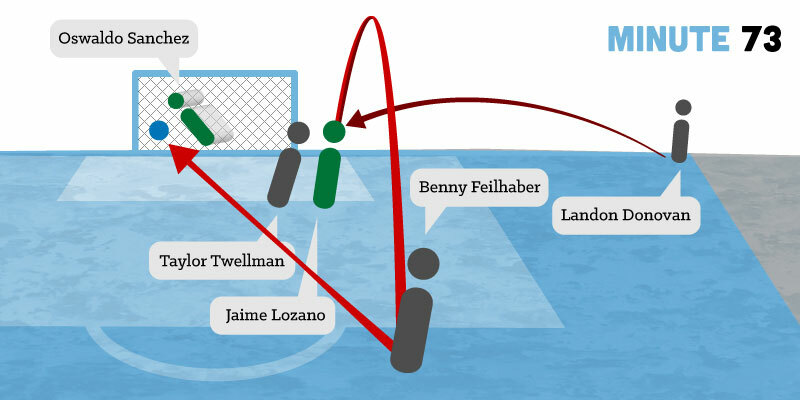 Feilhaber’s shot (above) rocketed past Mexico’s goalie to put the U.S. ahead for good. It was as perfect a strike as any player from any national team could hope for. By the time Mexico goalkeeper Oswaldo Sánchez left his feet to reach in vain for the volley, Feilhaber knew he’d scored. He ran toward the U.S. bench, arms outstretched and eyes tilted to the sky. He was slowed somewhat by midfielder DaMarcus Beasley, who was tugging on the back of Feilhaber’s jersey. The U.S. would hold on, thanks in part to some outstanding work from Howard, to win its fourth Gold Cup title. It remains the only time the Americans have bested the Mexicans in a continental final—El Tri holds a 4-1 edge in CONCACAF’s showpiece match—and it had far-reaching implications. If Feilhaber’s blast seemed like it came from a catapult, it was fitting. At that moment, the U.S. national team’s trajectory changed. The Americans’ 2007 CONCACAF victory—which remains the only time the U.S. has beaten Mexico in a continental final—had the players whooping it up on the victory stand. It would also launch the U.S. program to a whole new level internationally. n 2010, four years after failure in Germany, the Americans won a World Cup group for the first time since 1930. The climax, of course, was Donovan’s stoppage-time goal against Algeria (stay tuned to SI.com’s countdown for more on that one). The catalyst, however, occurred three years earlier in Chicago, where a team playing for a manager who’d shed the “interim” tag just a few weeks earlier began to come of age. Thanks to the Gold Cup triumph, the U.S. qualified for the Confederations Cup, a quadrennial tournament featuring continental champions that’s contested a year before the World Cup. In South Africa, Bradley and his team would use some of the same training grounds and hotels and play games at each of the three stadiums they would visit the following summer. There isn’t anyone in the U.S. program who doesn’t see a connection between the Confederations Cup run and the group stage triumph at the World Cup. None of that happens without that victory in Chicago. After opening the Confederations Cup with consecutive losses to Italy and Brazil, the U.S. slipped into the semifinals thanks to a 3-0 win over Egypt and some significant good fortune. There, the Americans would face top-ranked Spain, a juggernaut entering the match on a 35-game unbeaten streak. The 2-0 upset shocked the world. Jozy Altidore put the U.S. in front midway through the first half and Bradley’s team weathered the Spanish onslaught thereafter, ultimately yielding 29 shots and 17 corner kicks but no goals. Feilhaber replaced forward Charlie Davies in the 69th, which sent a message. The U.S. hoped to exploit the space left open by the desperate favorites and had to make smart decisions with the ball. Circumstances called for someone with skill and vision rather than mere muscle. It paid off. In the 74th, Feilhaber reached a pass from Michael Bradley, sidestepped Sergio Ramos then dribbled confidently toward the top of the penalty arc, where he froze two more Spanish defenders before sliding the ball to Donovan. The ensuing cross was misplayed by Ramos and then swept into the goal by Clint Dempsey. 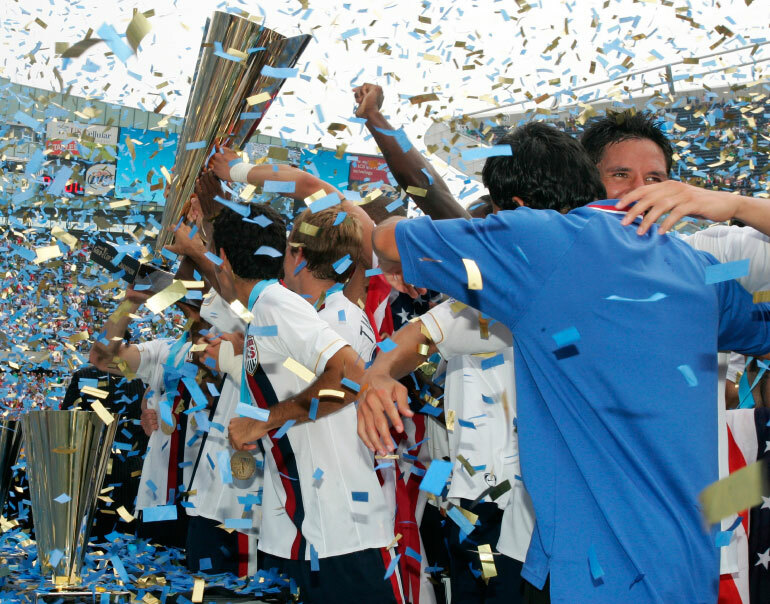 The victory over Mexico in the 2007 Gold Cup final qualified the U.S. for the 2009 Confederations Cup. Facing overwhelming favorite Spain in the semifinal, the Americans went up 1-0 on a first-half goal by Altidore and sealed the 2-0 upset win with this shot in the 74th minute by Dempsey. In the Confederations Cup final, which Feilhaber started, the Americans took a stunning 2-0 first-half lead but collapsed late. The 3-2 defeat stung. A year later, however, that silver medal would produce an obvious silver lining, and there isn’t anyone involved with the U.S. program who doesn’t see a connection between the Confederations Cup run and the group-stage triumph at the World Cup. None of it happens without that victory in Chicago. Call it a banner day: A passionate contingent of American fans showed their true colors in celebrating the U.S. victory over Mexico. eilhaber was there, standing just outside the Mexican penalty area, because he brought something a bit different to the field—a precision and sense of style that not many American players have possessed. Born in Rio de Janeiro (his father’s father was an Austrian Jew who escaped Europe in the late 1930s), Feilhaber moved to the U.S. when he was six. He flourished on suburban soccer fields in Westchester County, N.Y., and Orange County, Calif., and played his way onto the 2003 Bruins squad coached by former Columbus Crew manager Tom Fitzgerald. 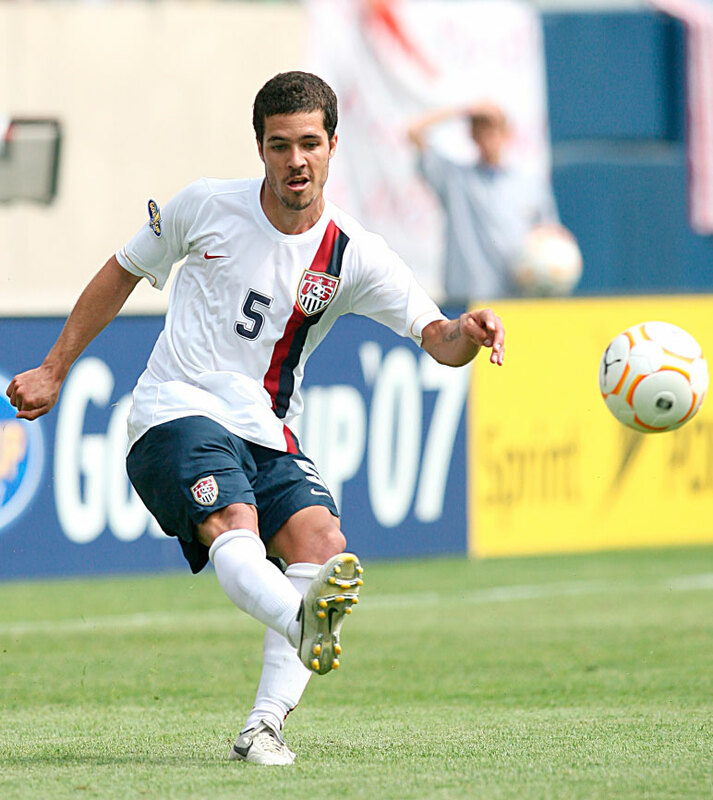 From there, Feilhaber’s rise was swift and in March 2007, he made his U.S. debut in a friendly win over Ecuador, having rejected an opportunity to switch allegiance to Austria. He scored his first international goal two months later against China and earned a spot on Bradley’s Gold Cup team that summer. It was a U.S. team in transition. In addition to long-time coach Bruce Arena, stalwarts Claudio Reyna, Eddie Pope and Brian McBride were gone. A year removed from a poor performance at the World Cup in Germany, Donovan was 25 years old and entering his prime. His speed and skill, especially in the open field, would help shape American tactics for the next several years. Goalkeeper Kasey Keller’s international career was drawing to a close while Howard’s was blossoming. Meanwhile, several young and/or influential players entered the picture. 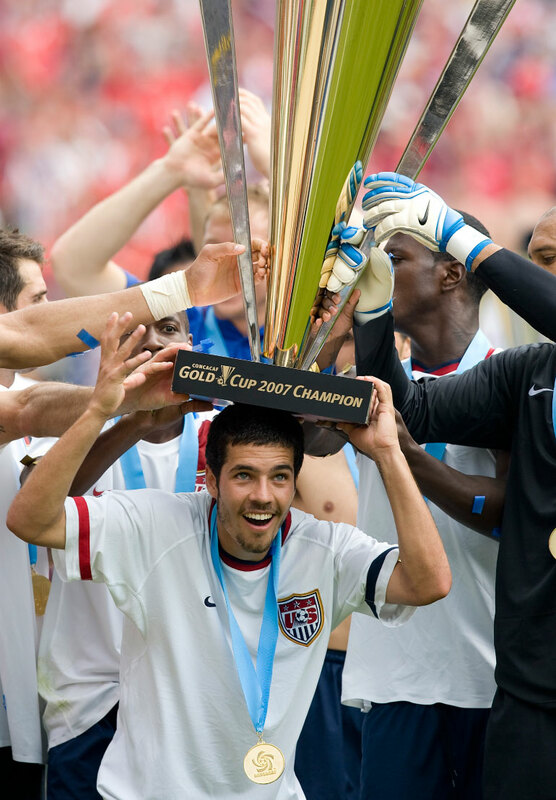 The 2007 Gold Cup would be the first major senior tournament for Feilhaber, 19-year-old Michael Bradley, Jay DeMerit and Ricardo Clark, among others. 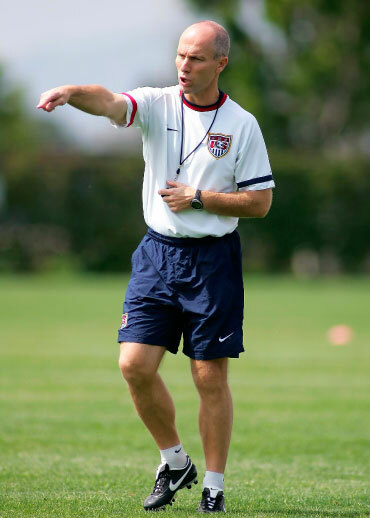 Taking over as U.S. coach at the end of 2006, Bob Bradley helped reshape the team, bringing in several young players, including Feilhaber. Twellman, a somewhat controversial cut from the 2006 World Cup team, remembered that Bob Bradley “took a lot of heat” for some of his choices. Feilhaber started each of the three first-round games and the U.S. opened the Gold Cup 3-0-0. But Beasley took his place in the quarterfinal and semifinal, a hard-fought and controversial 2-1 win over Canada during which Michael Bradley was red carded. That opened the door for Feilhaber to return for the final in Chicago. Born in Rio de Janeiro, Feilhaber (left) moved to the U.S. at age six. A walk-on at UCLA, he made the U.S. under-20 team in 2005 and two years later got his chance on the senior national squad. Brilliant with the ball, Feilhaber—here in the first half against Mexico—struck with confidence when he got his shot. Mexico had taken the lead on a 44th-minute goal from Andrés Guardado. It was Pablo Mastroeni who exited at the interval. He was replaced by Clark. Twellman then relieved Dempsey in the 68th, six minutes after Donovan’s equalizer. The U.S. used its third substitution in the 72nd. Frank Simek, a 22-year-old defender, entered for Jonathan Spector. Fans watching at home were listening to Fox Soccer Channel announcer Max Bretos talk about Simek as Donovan’s corner was headed away. It was one of the 10. Feilhaber says that he told roommate Jonathan Bornstein the night before the final that he had a “feeling” he’d score the game-winner. And he knew for sure at the moment his right foot made contact. It felt right. Feilhaber never saw the ball hit the net. He was turning toward the sideline as his shot rocketed inside the left post. His first instinct was to look for his family but after realizing they were too far up the Soldier Field stands, he headed toward the bench. “Benny and his jets,” Bretos yelled. On top of the world—or at least on top of some very happy teammates. Feilhaber didn’t even wait to see his shot hit the net, turning at first to look for his family in the Soldier Field stands before settling for a delirious landing on the U.S. bench. After the game, the U.S. players collected their medals and raised the big golden trophy. Feilhaber threw his jersey into the crowd. Feilhaber had told his roommate the night before the match that he had a “feeling” he would score the game-winner. That premonition came true in the most dramatic fashion, producing a crowning moment for him and his teammates. he next day, Feilhaber was one of several players who set out on a trip to Venezuela to compete in the Copa América. Bob Bradley left most of the Gold Cup squad behind and brought few regulars to the prestigious South American tournament. The real prizes—a win over Mexico and a berth in the Confederations Cup—had been secured. There wasn’t much of a chance to really revel in what had happened at Soldier Field. Feilhaber’s good friend, Chivas USA midfielder Sacha Kljestan arrived in Chicago the day of the final. They watched the SportsCenter highlights later that night. 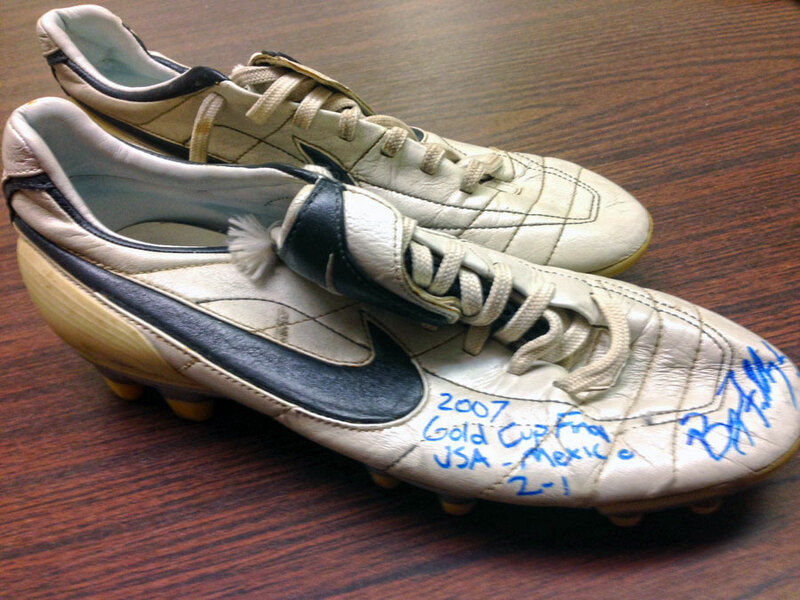 These are the shoes Feilhaber wore during the U.S.&apos; 2007 Gold Cup final victory over Mexico at Chicago&apos;s Soldier Field. Feilhaber had time to look at a couple of local newspapers on the way to the airport, and then the page was turned. The U.S. was beaten in all three games at the Copa América, which rankled fans back home. The long-term significance of Feilhaber’s goal wouldn’t be obvious for another two years, by which time he’d suffered through a miserable 2007-08 season at Derby County and had moved on to Danish club AGF Aarhus—a far cry from the Bundesliga and Premier League. Bradley kept the faith, however, and continued to call in Feilhaber despite his uneven production at the club level. He wasn’t consistently a complete, two-way player and didn’t really gravitate toward a leadership role. But when he was on, there were few Americans better with the ball. That showed in Chicago and then again against Spain in Bloemfontein. And it was enough to convince Bradley to take Feilhaber to the World Cup, where he appeared as a reserve in the matches against Slovenia, Algeria and Ghana. The U.S. faced nerve-wracking moments during each and Feilhaber, who would replace a forward, helped establish the right rhythm. In his 165 minutes on the field, the U.S. tallied four goals and gave up one. During the other 225, the Americans scored one and yielded four. Few score a goal like Feilhaber’s, one revered for its aesthetics and its importance—both on the day and as the catalyst for a team bound for bigger and better things. That’s not a bad legacy to leave. Feilhaber’s uneven luck continued, however. His World Cup performance didn’t lead to the club opportunity he wanted and he had no choice but to return to AGF, which had been relegated to the Danish second tier. Finally, he signed with the New England Revolution in the spring of 2011. But the rebuilding MLS team wasn’t the right fit. In December 2012, Feilhaber was traded to Sporting Kansas City, where he would recapture a bit of that 2007-10 national team swagger. He gradually developed comfort with coach Peter Vermes’ high-intensity tactics, tallied three goals and six assists and helped SKC to the MLS Cup title. His form so far this season has left many calling on Jurgen Klinsmann to consider taking Feilhaber back to Brazil, the land of his birth. But he has played just three times for the current U.S. coach and doesn’t appear to be part of the World Cup plan. Feilhaber, now 29, hasn’t scored an international goal in seven years. He has found a home in K.C., he can break a game open on a given day and he’s still regarded as one of the most talented U.S. players of his generation. But a legendary career requires more than talent. There should be consistency and transcendence and deep impact over time. Feilhaber’s doesn’t yet meet that standard. But that moment at Soldier Field—that was legendary. Countrymen have scored bigger goals or more beautiful goals, but it’s tough to find one boasting so much of both. “I don’t want it to be like the only thing that anybody remembers about my career,” he says. It may not be the only thing. But it will be the first thing. Few score a goal like that, one revered for its aesthetics and its importance—both on the day and as the catalyst for a team bound for bigger and better things. That’s not a bad legacy to leave. It was the sort of goal every player dreams of scoring. But only a few are capable. 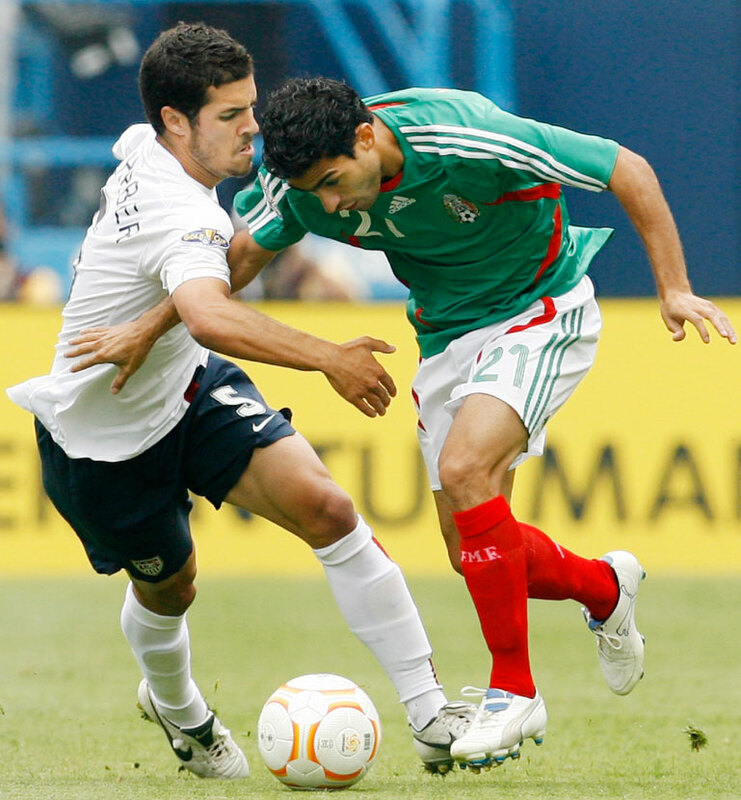 Though Feilhaber’s career since 2007 has been uneven, on that afternoon against Mexico the gifted young player, here being trailed by an exuberant Beasley, produced a moment for the ages. TM & © 2014 Time Inc. A Time Warner Company. All Rights Reserved. Terms under which this service is provided to you. Read our privacy guidelines, your California privacy rights, and ad choices .